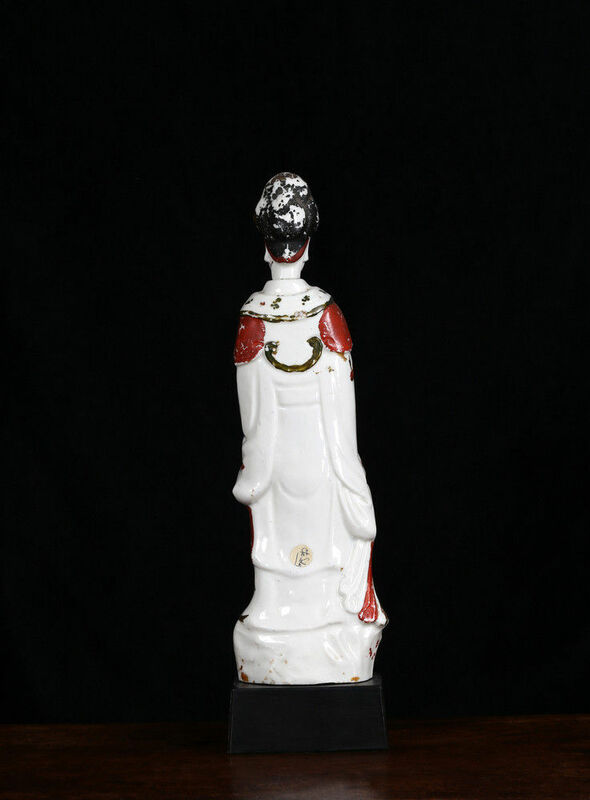 A cold-decorated Dehua figure of Guanyin standing beside a phoenix painted in black, gold, green and ochre. 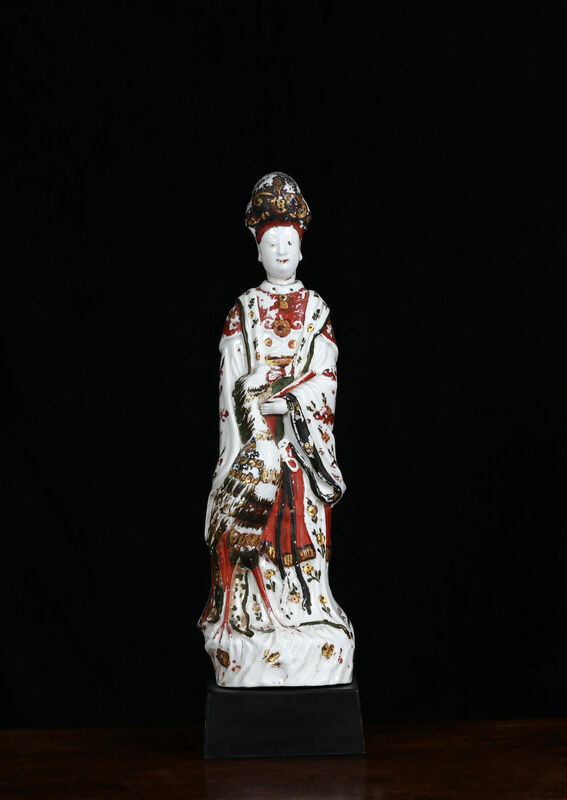 Dutch traders imported large numbers of blanc de chine figures from Fujian in southern China in the 17th century and they quickly became an essential part of the decoration of royal and princely baroque porcelain cabinets across Europe from Italy, Germany, Denmark and England. 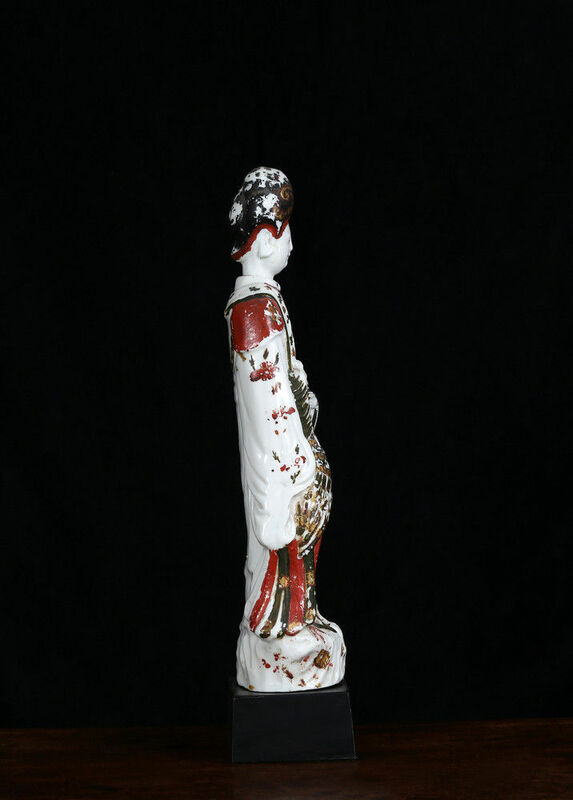 In numerous instances these figures were enhanced with unfired decoration in the bold strong colours favoured at this period; being unfired this decoration has usually degraded and been rubbed off. It is generally only seen in those early collections that have remained relatively untouched such as those of the Porzellansammlung in the Zwinger in Dresden, Arnstadt, the Pitti Palace in Florence and at Rosenborg Castle in Copenhagen. This is one of the best preserved examples of this type of decoration to have been on the market in recent years. Examples of blanc de chine figures with traces of cold decoration are recorded in inventories of the Danish royal collection as early as 1690. A group of similarly coloured pieces in the collection of the Pitti Palace in Florence arrived with the Electress Palatine after she was widowed and returned from Dusseldorf, it is recorded that she instructed the court artist Foggini to get a local artist to decorate them in around 1721. Augustus the Strong was acquiring example for the Japanese Palace in Dresden around 1720. It is probable that much of this decoration was added by the Dutch importers but other pieces were decorated across Europe; unlike fired decoration this needed no complicated technology to apply. The porcelain, late 17th century, the decoration 1700-1720. 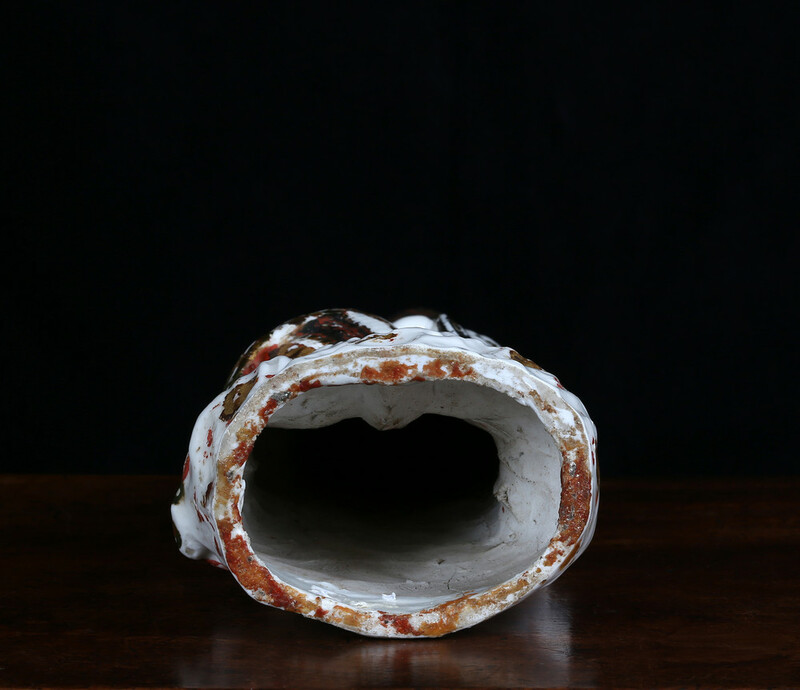 Condition – The porcelain in perfect condition, some visible flaking to the painted decoration. Provenance – Collezione Busca, Villa Serbelloni.